How to get there: This peak can be accessed from Hwy. 13 connecting Vik in Sogn with Vinje. Drive Hwy E-16 from Bergen, first 100 km to Voss, then onwards to the traffic circle in Vinje. make a left here onto Hwy. 13 that crosses Vikafjellet. 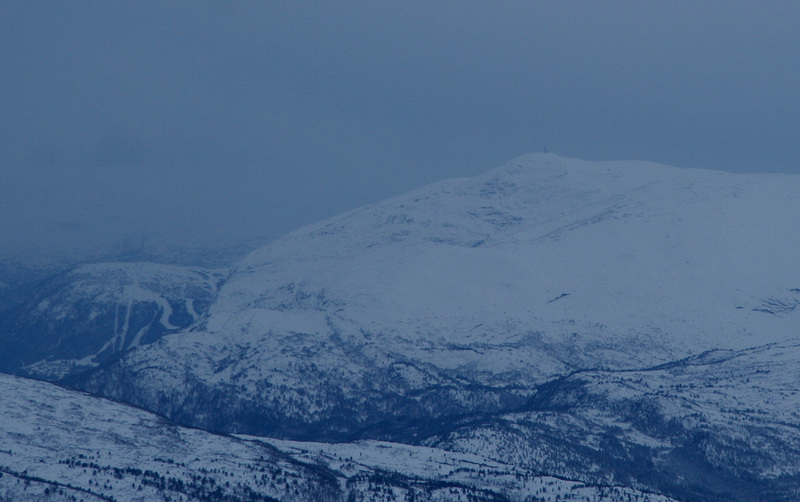 Drive until you see the Myrkdalen alpine skiing center on your left. The first right exit a short stretch further is signed for Årmot. Turn right here. You will soon arrive at an uphill with a road toll collection (self serve) on your right. 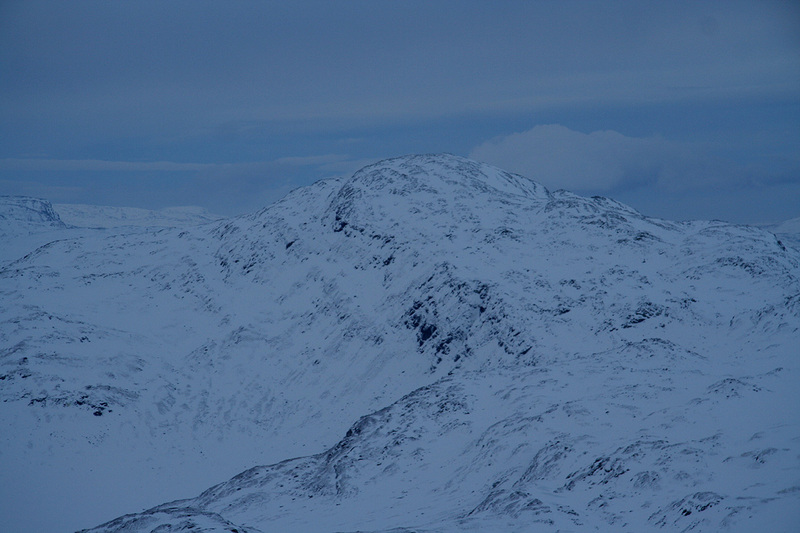 The toll is NOK 30 (December 2009). In summer, one can likely drive up this road. In winter, the road may be closed just at the top of the first hill. Do ask for permission to park somewhere near here. We drove up the first hill and parked near a yellow house (where the road ended in winter). This location was N60:51.501, E006:30.247, elevation 476 meter. 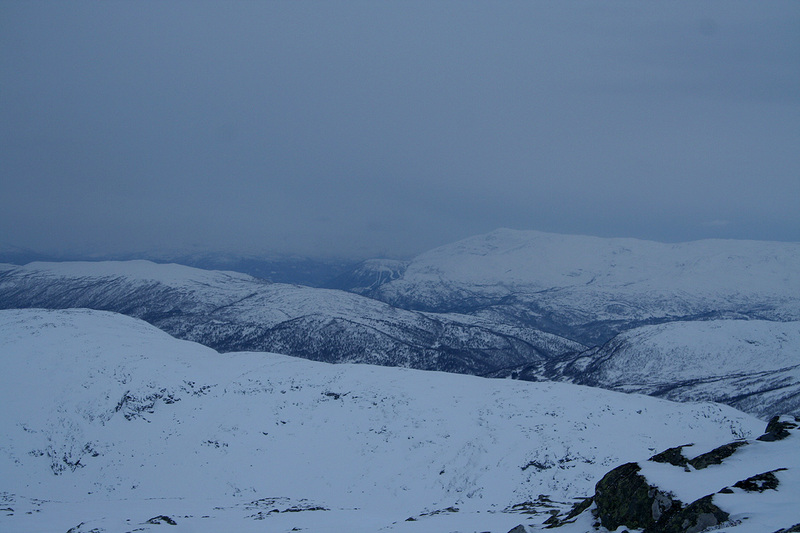 Route description: Continue up the road to the cottages named Revhaugen, elevation about 700 meter. From here, descend slightly and cross Kvanndalen more or less directly towards the farm cabins called Kvanndalen, located at about 860 meter of elevation. From here, there are several alternatives. 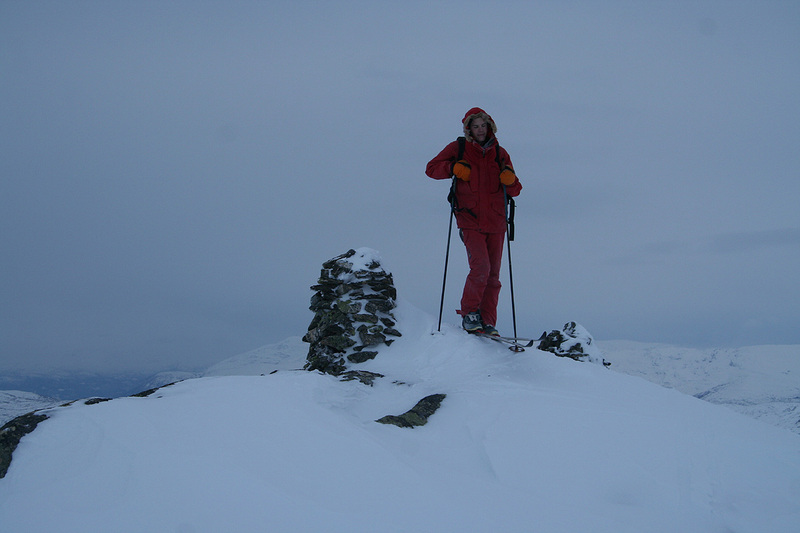 We skied (slightly east of) south and ascended to the saddle between Høgafjellet, 1097m, and Geitaberget, 1239m. 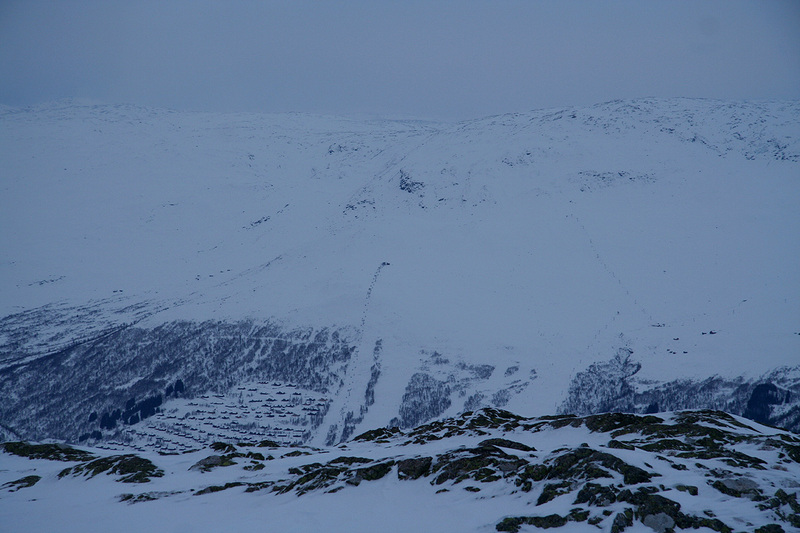 From here, we ascended Geitaberget, there are several passages that works well on skis. Descend slightly to the saddle, then climb the final slope to the summit of Larsfonnberget. 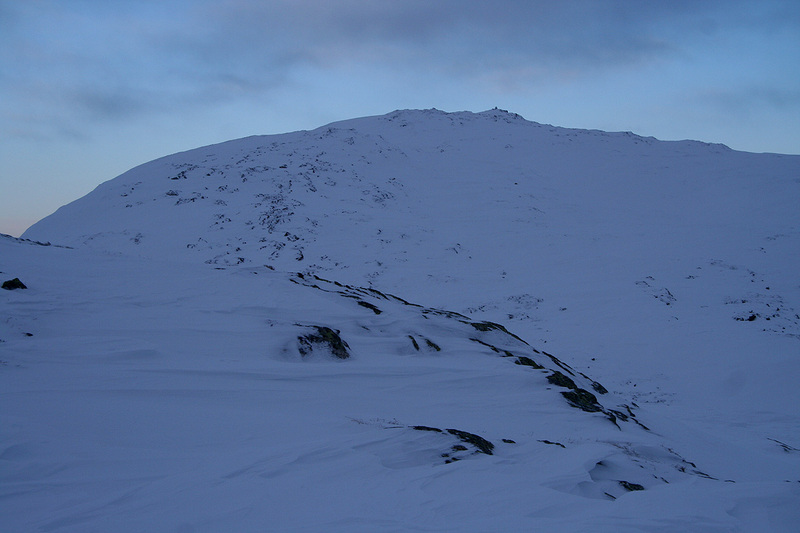 An alternative route would be to ascend the ridge north of Geitaberget and arrive in the same saddle. Comments: I did this hike with my son Pål Jørgen. We started at 1020 and arrived at the summit by 1340. After about 20 minutes we skied back down arriving at the car at 1530. We just had a major snowfall. The snow was deep and supported nothing. Thus, we broke a pretty deep trench most of the way. 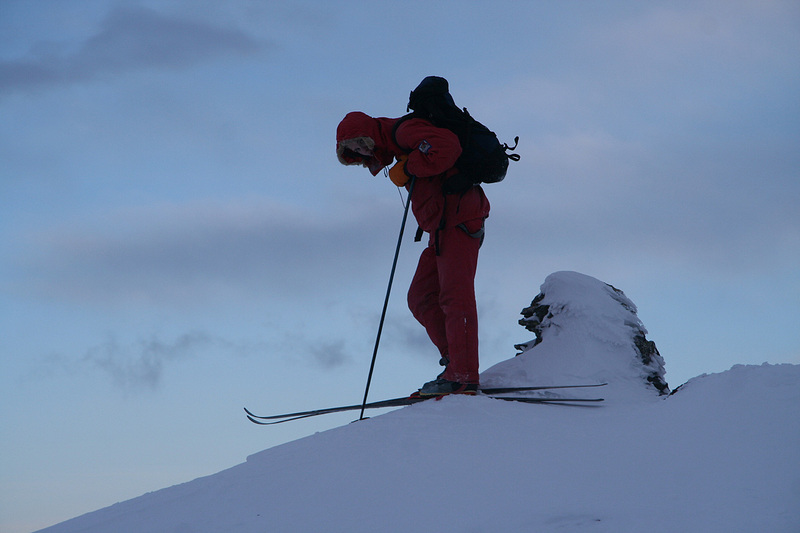 Hard work, but this is fairly common when skiing in the backcountry in December. Thanks to Pål Jørgen for a good trip! 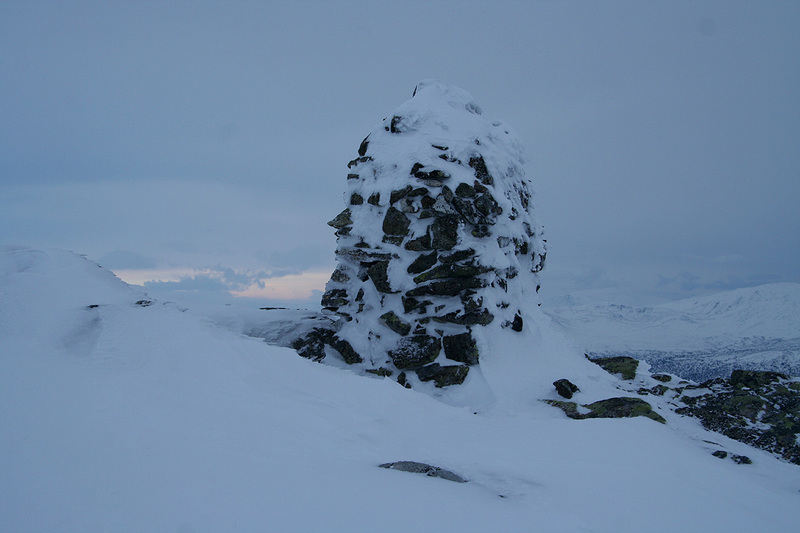 The main cairn. Located about 20 meter away. 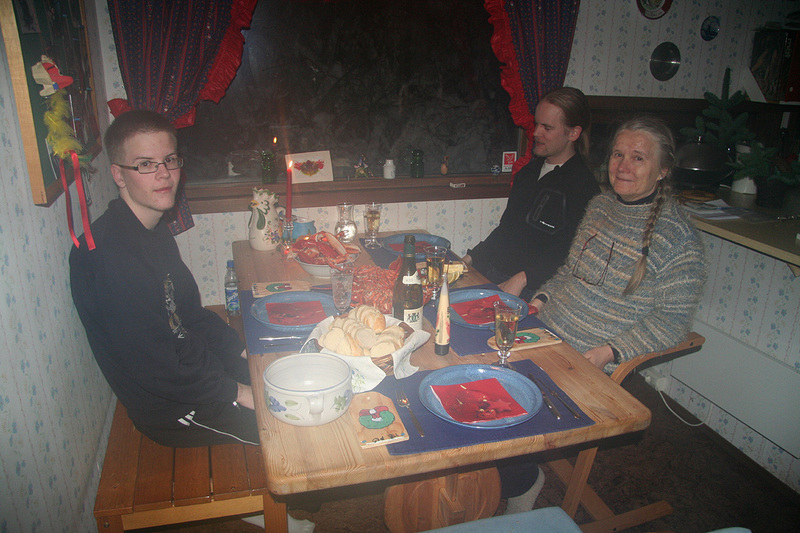 Special dinner, celebrating that Tor Erling has finished writing his Ph.D. thesis.